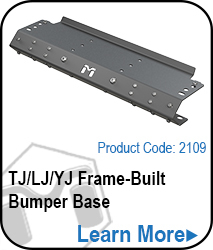 The 52” Hi-Crawler Cap for the TJ/LJ/YJ/CJ Frame-Built bumper system adds another level of protection and style for you Jeep. Measuring 52” from end to end and designed to go with our Hi-Mount Shackle Kit (2131) the Hi-Crawler gives you clean lines and awesome approach angles. 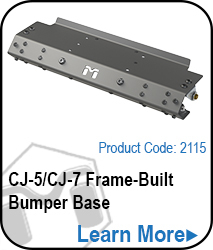 Part of the Frame-Built Bumper System for Jeep CJ’s and Wranglers (’73 - ’06), the 52" Crawler Caps provide a clean, yet rock-crawling, strong profile to your rig. Due to the unique design of the 52" Crawler Cap, you can shorten it (cut it) to meet your needs.